A light data week from New Zealand, but it only took one bad apple to bring out Kiwi bears in full force and put the New Zealand in position to be the second worst major currency of the week! Global risk sentiment was likely the contributing factor to the Kiwi’s relative performance this week, and for a broad rundown of what drove global risk sentiment, check out my review of this week’s drivers and broad market behavior in my Japanese yen weekly review here. In short, we saw early risk-on sentiment to start the week (likely a carry over from Friday’s bullish sentiment on positive U.S. data) that kept the Kiwi as an early top performer, but traders turned bearish on risk assets from Wednesday on as the picture of global growth turned gloomier, mainly on a heavy week of negative economic reports from around the globe. Despite a bounce in global risk sentiment going into Friday, traders stayed in risk-off mode, and it’s likely the reason why we saw the New Zealand dollar’s performance against the safe havens far under perform versus its under performance against the high-yielders (AUD and CAD) to close out the week. Outside of global risk sentiment, we have a couple of uniform moves to talk about. First, the bearish turn for most Kiwi pairs going into Wednesday’s Asia session. 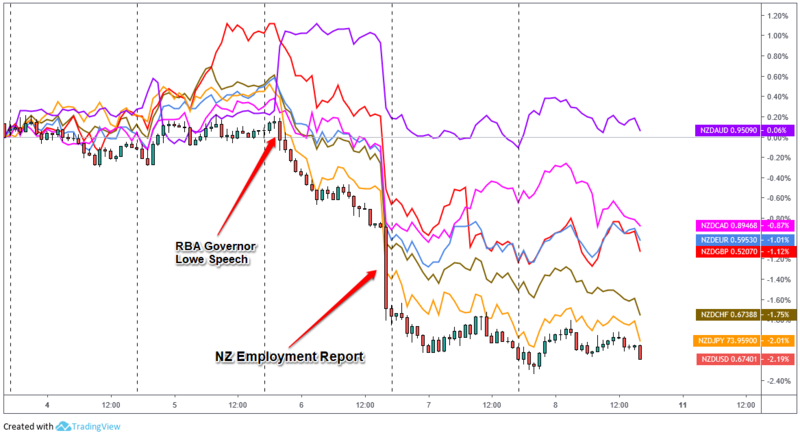 There were no direct New Zealand catalysts we could spot, but it was correlated with the sudden big bearish shift on the Aussie after dovish comments from Reserve Bank of Australia’s governor Philip Lowe during a speech. Because of the the close trading relationship between Australia and New Zealand, it’s possible traders went bearish on the Kiwi as well on the idea that New Zealand’s economy could be on a weaker path if Australia start to weaken as well. And it wasn’t too much longer that we got a sign of potential weakness coming to New Zealand with the second big Kiwi event: the quarterly New Zealand employment report. This was a much weaker-than-expected report with not only the headline unemployment rate coming in at 4.3% versus the 4.1% forecast, but the previous quarterly unemployment read was downgraded from 3.9% to 4.0%. And overall, net job growth came in at 0.1% versus the previous downgraded read of 1.0% growth. Ouch! Traders sold Kiwis quickly on the idea that this weak report could lead to the Reserve Bank of New Zealand to cut rates at next week’s meeting on February 12. And with no further New Zealand catalysts to help Kiwi bulls out (and the persistent bearish global risk sentiment conditions all week) the New Zealand dollar stayed in the red into the weekend to come in as the second biggest loser of the week behind the Aussie dollar!